For a quick conversion of Celsius into Fahrenheit, double the Celsius temperature and add 30. So if it's 14 degrees Celsius, you'd double 14 and get 28, then add 30 to get a Fahrenheit temperature of about 58. This formula will usually get you within a 2 or 3 degrees. If you wish to convert Celsius to Fahrenheit more precisely, take the Celsius temperature, multiply it by 9, divide it by 5 and add 32. By Canadian standards, Vancouver-Surrey is considered to have a very pleasant climate year round. Temperatures are moderated by the Pacific Ocean and Coastal Mountain Range, which keep temperatures a bit cooler in the summer and warmer in the winter. And while we are known for having a lot of rainfall, we actually get an average of 41 inches, less than places you probably don't consider overly wet, such as Boston. Summers are usually dry and sunny. July and August usually see temperatures in the mid 20s (mid 70s), though temperatures can push higher for a stretch of a week or two, particularly in late summer. It rarely gets humid. You may need a light jacket or a sweater for any cool evenings. Autumn typically has mild, pleasant temperatures, and summer-like temperatures can stretch into October. October and early November temperatures, though, usually run in the 10-15 Celsius degree range (50-60 F). Fall often means the beginning of rainy season, so bring an umbrella or other water-proof gear. Winter temperatures in Vancouver-Surrey surprise many Americans, as the temperatures are generally quite mild. The average temperature from late November through February run in the 5-10 degree Celsius range (40s F). It rarely drops to freezing, so other than in the mountains bordering the city, we don't get much snow. Instead the area tends to develop overcast skies and our area can get more than it's share of drizzle--a lot like Seattle. Still, Surrey is the sunniest portion of the Vancouver metropolitan area, and when the weather's clear, the views of the snow-capped mountains are spectacular. Spring tends to come early and are usually quite pleasant. Roses can bloom as early as January, and by February the crocuses and daffodils will begin popping up. It can still be wet for stretches of a week or longer. Shopping can be found quite near the office of Shockwave - BC at the Guildford Town Centre Mall. (It's just a short walk away from our office.) Similar malls can be found in the surrounding suburbs of Langley (Willowbrook mall) and Coquitlam (Coquiltam Centre). Downtown Vancouver has very good shopping, most notably the boutiques on lively Robson Street (right), the stores at Pacific Centre Mall, and the shops in trendy Yaletown. If you arrive by Skytrain, get off at the Granville Street Station, which will put you at the Pacific Centre Mall, a good place to start. Pacific Centre Mall borders Robson Street, making access to shopping there handy, too. Hiking / Parks can be found throughout the area. Surrey is known as a city of parks--we have 473--and both Tynehead Park and Green Timbers Park offer pleasant walks within a five-minute drive from our office. 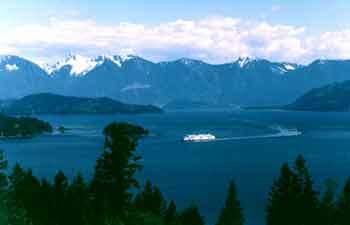 Vancouver is well-known for Stanley Park, Queen Elizabeth Park, and the Pacific Spirit Park. But if you really want to get into nature, the many parks of the North Shore (right) are not to be missed. 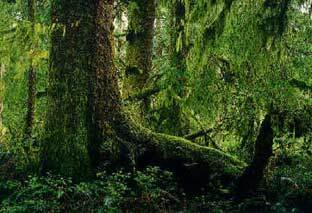 In some locations you can hike for miles through these parks and experience the Pacific rainforest without encountering a soul. Ocean walks can be found closest to our office in the community of White Rock in South Surrey. White Rock's beach is characterized by many shops and restaurants on one side of the street, with the beautiful beach and views to the U.S. on the opposite side. Vancouver also has beaches. 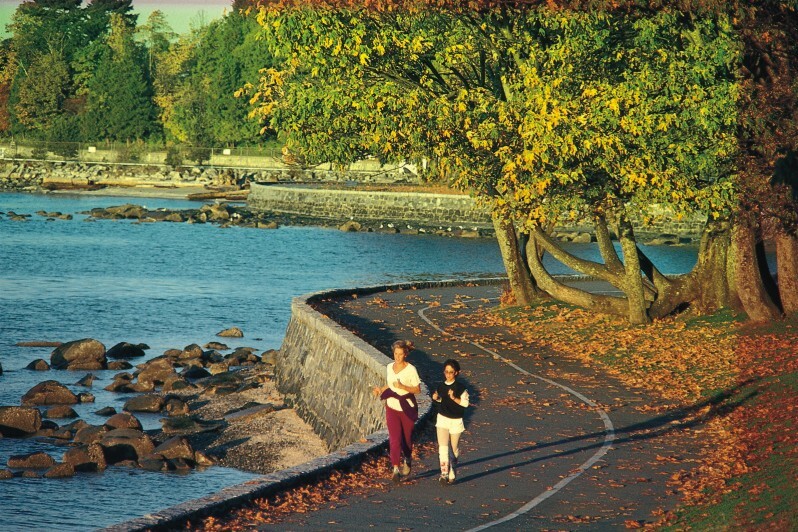 English Bay's beach begins in the West End of the downtown, then turns into the Stanley Park Seawall (right), which circumnavigates Stanley Park. Another nice beach is Jericho (pictured right), with its views of Vancouver and the North Shore. Long Beach on west side of Vancouver Island offers long expanses of empty sand and pounding surf. Locations on the east side of Vancouver Island like Qualicum Beach offer much quieter and protected shoreline. Vancouver City Tour Gray Line offers entertaining tours of the top Vancouver sites. This is a great way to get an overview of the city and see the major sights without being on your feet. The Vancouver Aquarium, in Stanley Park, is worth a trip to downtown Vancouver. Golfing is very good in the Vancouver-Surrey metropolitan area, and with over 50 nearby courses, it's plentiful. And with our temperate climate, you can hit the links nearly all year long. Here's a link to area courses. 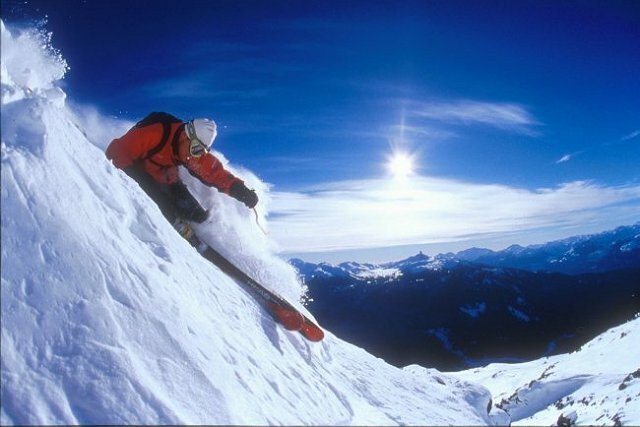 Skiing in British Columbia is about as good as it gets anywhere. The three hills serviced by the city bus system (Cypress Bowl, Grouse Mountain, Mount Seymour) all offer good skiing. But Whistler-Blackomb is spectacular. Fort Langley, B.C. 's early trading post on the Fraser River, (a 15 minute drive from our office), is maintained by Parks Canada as a living museum, much as it was in its heyday (1827-1927). Gastown is the older portion of Vancouver, just east of the current downtown. Noted for its cobblestone streets, Victorian architecture, the steam clock (pictured to the right), good restaurants, and many shops, Gastown makes for a nice stroll. Take Skytrain to its last stop, Waterfront Station. Then walk east a couple blocks. Granville Island, (which is really a peninsula, not an island), is a favorite stop for locals as much as it is for tourists. Art studios and workshops, street performers, and the wonderful public market (far right) is filled with the freshest produce, fish, meats, cheese, and bakery are the major draws. There are also restaurants, house boats, a theatre, a book store, small shops--you can even rent a kayak. Parking can be difficult, so why not arrive by Aquabus (shown to the right)? North Shore The North Shore consists of the Vancouver suburban communities of West Vancouver and North Vancouver. Hemmed in by the North Shore mountains and the sea, the scenery is spectacular and there's lots to do. West Vancouver Canada's wealthiest community is built into the slopes of the North Shore Mountains. West Van has good shopping in the shops along Marine Drive and at the Park Royal Mall. North Vancouver Explore the stores along Lonsdale Street and the Lonsdale Quay Marketplace on the waterfront. The Quay offers lovely views across Burrard Inlet to Vancouver, and it's easy to get there from Surrey by Skytrain to Waterfront Station, then hop on the Seabus across Burrard Inlet. Lions Gate Suspension Bridge is the historic main gateway bridge from downtown Vancouver and Stanley Park to the North Shore. Grouse Mountain Take the tram up to the top of Grouse Mountain for a spectacular view of the Vancouver metropolitan area. 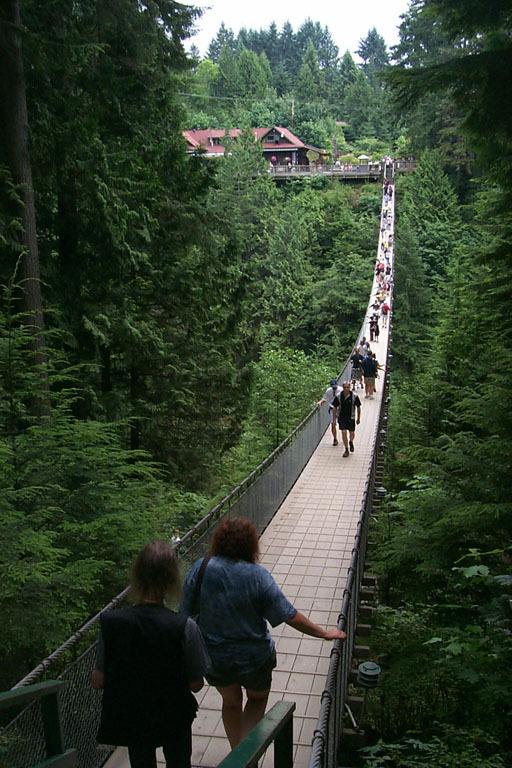 Capilano Suspension Bridge (above) spans a river gorge, and is one of the biggest tourist attractions in British Columbia. Just minutes from downtown. North Shore Parks offer very scenic hikes, some very challenging, and mountain biking through the rainforest of British Columbia's coast. The Vancouver Metropolitan area has a huge immigrant population. (One in three residents is an immigrant, and nearly one in two in Vancouver, itself.) And with one in three of Vancouver's residents being of Chinese descent, it's probably not too surprising to learn that Vancouver's Chinatown is Canada's largest. 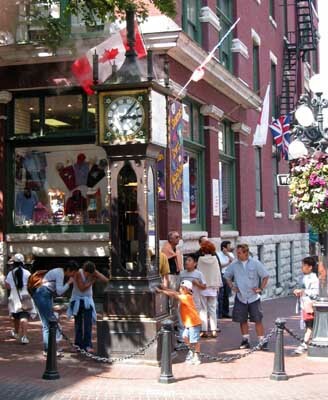 Located nearly very near Gastown, (discussed above), it's worth a trip to find a concentrated collection of interesting shops and good food. Visit on the weekend, when it is particularly energetic. You'll find the Dr. Sun-Yat Sen Garden worthy of a stroll--and keep your eye out for the world's narrowest building at Pender and Carrall Streets. 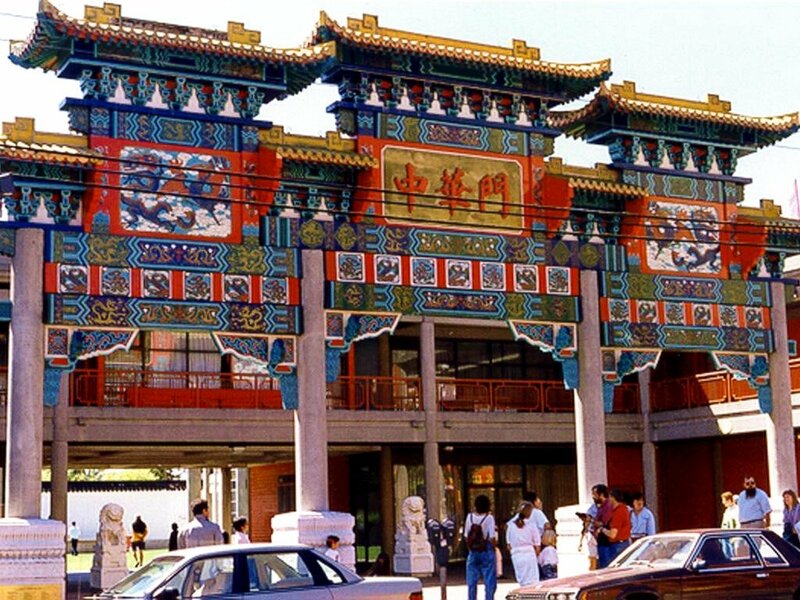 Still, while Vancouver's Chinatown is the best-known Chinese community in the metropolitan area, Vancouver's southern suburb of Richmond has now become host to the largest Chinese community in the metropolitan area. 40% of the population there claims a Chinese descent. 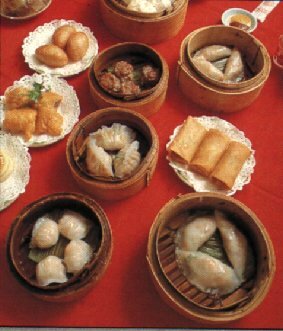 Richmond is home to some of the best dim sum (a Chinese brunch typically served by carts rolling by your table) on the continent. There are 49 Asian malls in Richmond, and in some, you may not find English widely spoken. For an interesting evening experience, the Night Market at Landsdowne Centre is held on Friday, Saturday, and Sunday evenings during the summer begins at 7 pm. Stroll through the sight, sounds, and smells of China. With a population of 80,000+, the second-largest visible ethnic group in the Vancouver Metropolitan Area is the East Indian community. The largest Indian community in the metropolitan area is at the Surrey-Delta border area of Scott Road (120th Street) from 96th Avenue south. 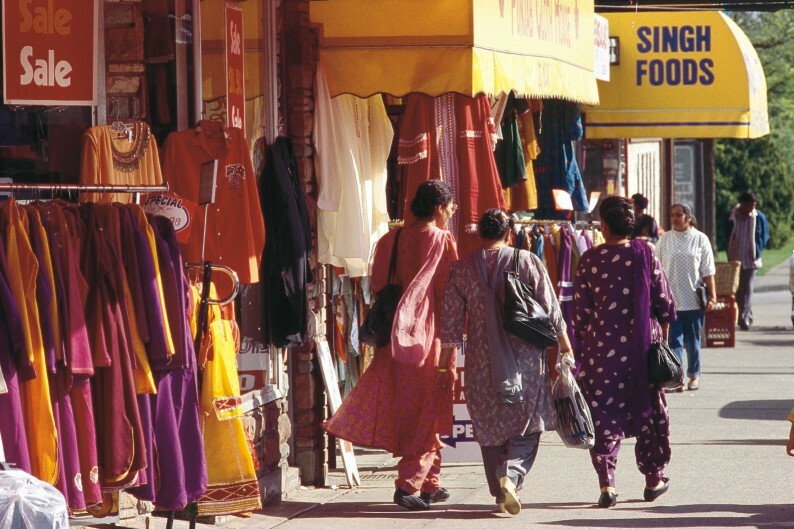 In Vancouver, the Indian community is focused at 49th and Main Street, a region known as the Punjabi Market. At either location you can experience the sounds, smells, sights, and tastes of India as you visit stores selling jewelry, saris, and unrecognizable food and spices. Sea to Sky Highway A great way to spend a sunny day is the drive up the "Sea to Sky Highway. It starts in West Vancouver on the North Shore, then winds up the fjord known as Howe Sound to Squamish, then on to Whistler. Along the way are breathtaking views of the Sound and the mountains and Shannon Falls. You'll likely see rockclimbers on the face of the Stawamus Chief (an enormous face of granite great for rock climbing or hiking) and windsurfers on the waters of Howe Sound. Squamish has some interesting shops, and you'll find lots of stores and good restaurants in Whistler. Victoria, on Vancouver Island, lies a scenic 1.5 hour ferry ride away from the Tsawwassen Ferry Terminal south of Vancouver. 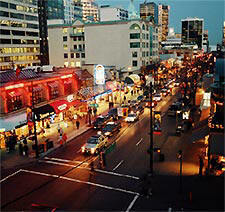 Downtown Victoria is tourist- and walking-friendly, with scores of restaurants and shops. 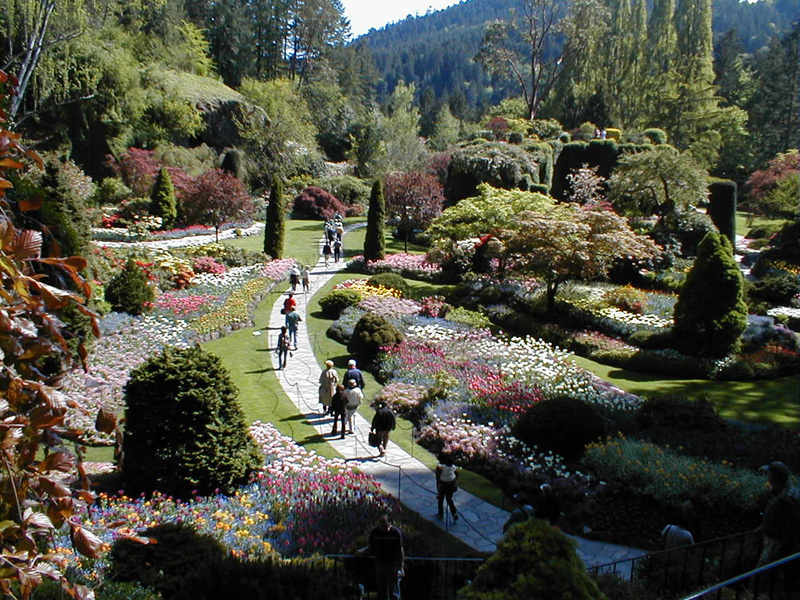 Visit Butchart Gardens (right); have high tea at the Empress Hotel; take in the Royal British Columbia Museum. Or maybe you'd prefer the Royal London Wax Museum, the Butterfly Gardens, Miniature World, Anne Hathaway's Cottage, the Undersea Gardens, or any of Victoria's other tourist attractions. Entertainment In The City Vancouver has a lot to offer in the way of entertainment. The NHL's Canucks play at GM Place. The CFL's BC Lions play at B.C. Place Stadium across the street (right). You'll find concerts, comedians, plays, musicals, opera, ballet--you name it. Pick up the free newspaper, the Georgia Straight, for information. Our facility is in the Guildford portion of north Surrey. This area is pretty well self-contained, and you can walk to many facilities. But if you wish to travel outside the Guildford area, the easiest way is by car. Located at the Sheraton Hotel a couple blocks from us. Alternatively, call the car rental agency of your choice, most of which have locations in our area. The Vancouver-Surrey metropolitan area's transit system, Translink, can also be helpful. Buses can get you around Surrey pretty well. If you wish to travel downtown, Burnaby, or New Westminster, taking Skytrain (right) is a good bet. 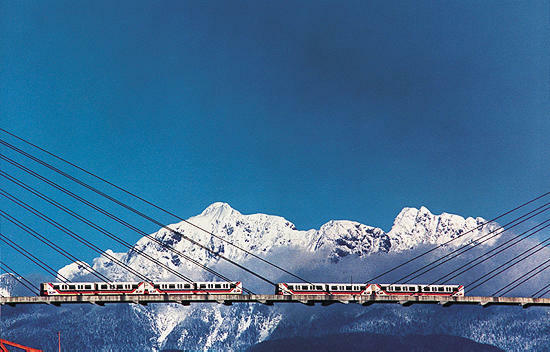 Skytrain is Vancouver's rapid transit system. The first fully-automated and driverless system in North America, Skytrain is a handy way to get from Surrey to downtown Vancouver for a reasonable price without a car. New routes into Richmond and the airport, as well as Coquitlam are being constructed now for completion before the Winter Olympics coming to Vancouver in 2010. 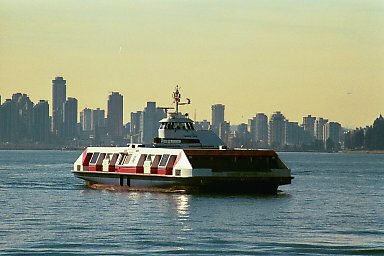 At the last Skytrain stop (Waterfront Station), you can connect with the Seabus (right) to take you over to the North Shore community of North Vancouver. Those visiting our facility in north Surrey will find that there is a wide variety of restaurants available. We couldn't list them all, but here is an assortment very near our facility. Quite possibly the nicest restaurant in all of Surrey, this fine dining establishment is well worth the 15-minute drive. (Take 152nd Street south to 72nd Avenue, then turn right. Drive past 135th Street and it's on your right.) To check their menu at any given time, here's their website. With particularly large Chinese populations, Vancouver and Richmond are the areas most noted for Chinese food, but in North Surrey, you might wish to visit Lee Yuen. Beyond the unassuming exterior is arguably the best Chinese food in north Surrey. Located in the Sheraton Guildford Hotel, one of our recommended hotels, this restaurant offers good-quality food in a pleasant environment. This restaurant is a short distance north of our facility. Akasaka is quality Japanese and Korean restaurant located at is a half block off 152nd Street on the south side of 101st Avenue, a short walk away from our facility. 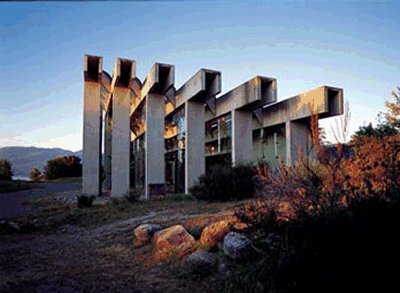 It's across the street from Hanago (discussed below). Located in the Sandman Suites Hotel, one of our recommended hotels, this new restaurant offers good, varied fare in an enjoyable location. 10090 - 152nd Street, near Jade Valley above. Also located in the Impact Shopping Centre Mall, a block south of our facility. Maguro has a variety of Japanese dishes. Good quality sushi and sashimi. A stone's throw away from our facility, the newly-remodeled Earl's has a varied menu, good service. Hanago is on the corner of 152nd Street and 101 Avenue, a short walk away from our facility, just behind the Wendy's Restaurant. A couple blocks south of us, the Keg is best known for steaks and seafood. 10330 - 152nd Street in the Guildford Place Mall, across the street from the Guildford Town Centre Mall and a block north of our facility. This is a family-run restaurant offering inexpensive sushi and a few other Japanese dishes. A new restaurant a quick walk from our facility. Anducci's serves Italian food. 10090 - 152nd Street, quite near Maguro below. Located in the Impact Shopping Centre Mall, a block south of our facility, Jade Valley offers good Chinese food, speedy service, and reasonable prices in an unpretentious setting. A long-time, well-known B.C. favorite just a short walk from our facility, this family restaurant chain provides good burgers and comfort food. It can get busy during traditional meal times. 10330 - 152nd Street, just a block north of our facility. Reservations not required. Kim Hoang serves a variety of Vietnamese dishes, including Pho, (the name of Vietnamese noodle soup). Best known for their burgers served in a lively, atmosphere. 14357 - 104th Avenue, two blocks north and eight blocks west from our facility. Reservations not required. Specializing in Pho, (the name of Vietnamese noodle soup), the Pho Hoa chain serves up excellent soup, served very quickly at inexpensive prices. Particularly good on cold, rainy days. Primarily known for pizza and pasta dishes in a lively atmosphere. Located on the premises of the Ramada Inn and Suites Guildford, one of our recommended hotels, This family restaurant offers good standard fare. There are dozens of Indian restaurants up and down Scott Road (120th Street), but this one is a consistent bet. 10330 - 152nd Street, a block north of our facility. A restaurant so popular in Canada that it is almost part of the Canadian culture. Tim Horton's is best known for donuts and coffee, though they also serve soups and sandwiches for lunch and dinner. The nearest Starbucks in the ubiquitous chain is on the east side of 152nd Street just south of 102A Street. 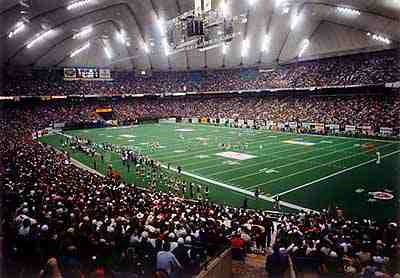 It's a stone's throw from our facility. Located a short block north of us on 152A Street, Java Planet has coffee, snacks, and billiard tables. Facing 152nd Street in the Guildford Town Centre Mall, Death By Chocolate has wonderful desserts. You'll spot it near the Old Navy store (which is quite visible from 152nd), quite close to our facility. Bread Garden is a step up from typical fast food. But the food is fast (and good), so we've included it here. It's located at the Guildford Town Centre Mall near the 152nd Street entrance, quite near Old Navy (visible from 152nd Street) and Death By Chocolate (discussed above). McDonald's is at the corner of 152nd Street and 102A Avenue, is less than a block north of our facility. Quizno's is less than a block south of our facility at the Boardwalk Mall. There are several fast-food restaurants at the corner of 152nd Street and 101st Avenue, (a short walk from us). A&W is located at the northeast corner of the intersection and Wendy's is at the northwest corner). Nando's (Portuguese-style chicken) is on the southwest corner. Subway, in the Impact Shopping Centre, is just a bit further south of 101st Avenue on 152nd Street. A mile or so down 152nd just north of the Fraser Highway are a KFC / Taco Bell and a Dairy Queen. There are more fast food restaurants in the Guildford Town Centre Mall's Food Court. 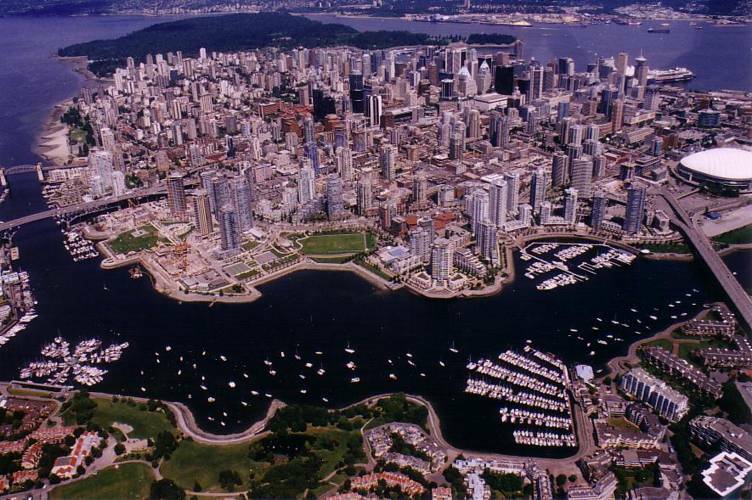 The Vancouver-Surrey metropolitan area is Canada's 3rd largest after Toronto and Montreal. We have some 2.2 million people in the metropolitan area. Vancouver has about 565,000 of those people; Surrey has the next largest portion, about 400,000. 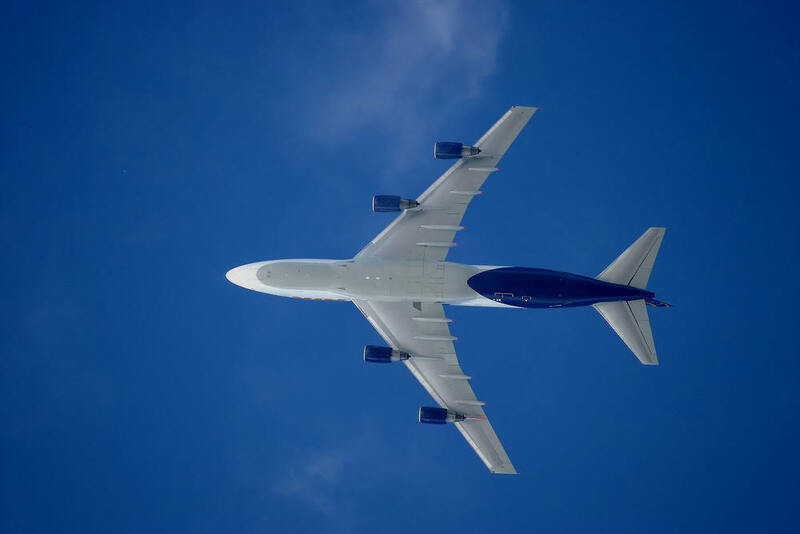 And with more than 1,000 people arriving each month, Surrey is one of the fastest growing cities in the nation. In fact, Surrey will pass Vancouver in size about the year 2020. 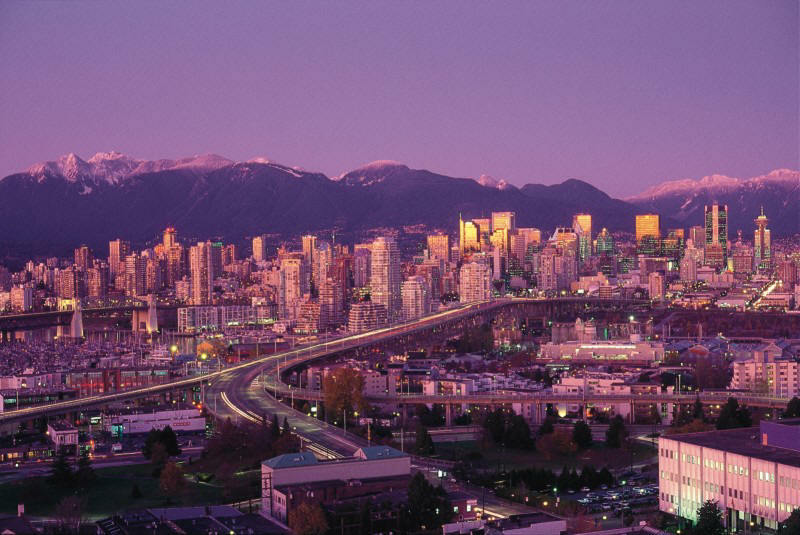 The Vancouver area consistently ranks in the Top 5 in most worldwide rankings of cities. For example, according to the Mercer Human Resource Consulting Firm, which ranks 215 cities worldwide in terms of quality of life, in the last half dozen years, we've ranked 1st (1999, 2000, 2001), 2nd (2002, 2003) or 3rd (2004) in the world. With it's unique combination of snow-capped mountains, beautiful ocean and verdant forests, Vancouver has one of the most spectacular scenic settings of any city in the world, frequently compared with Cape Town, South Africa--Rio de Janeiro, Brazil--and Hong Kong, China. Vancouverites dine out more than any other city in North America. But take note that you cannot smoke in restaurants here. 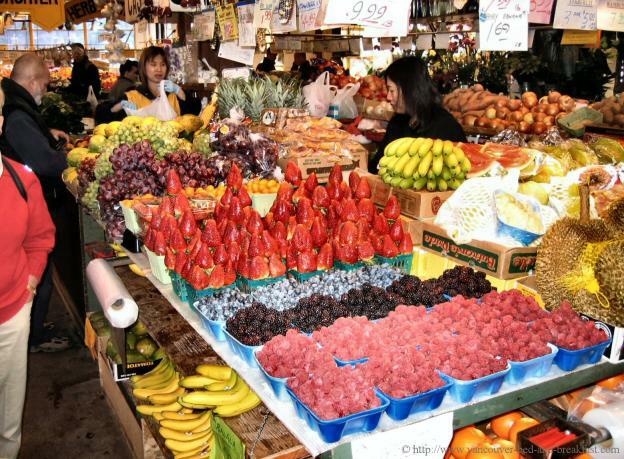 Vancouver is one of the most multi-cultural cities in the world. The 2001 census showed that 46% of the population were immigrants. With 2/3 of those immigrants being Asian, (particularly Chinese, East Indian, Filipino, we have the highest percentage of Asians of any North American city. Vancouver is the most expensive city in Canada, and one of the most expensive in North America. 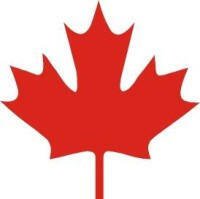 We have the nation's highest real estate prices and Canada's most expensive neighborhood (West Vancouver). The West End neighborhood near the downtown core is by some estimates the most densely populated area in North America. Vancouver has the second-largest film production industries in North America. In fact, 10% of Hollywood films are produced in Vancouver, along with several TV series. There are three major studios currently located here: Lions Gate, Paramount, and Bridge Studios. In North America, Vancouver's port ranks #1 in total foreign exports, #1 in total cargo volume, #1 in total cargo handles and #1 in total containers passing through. Vancouver was the birthplace of Greenpeace.